$9.07 on Amazon look inside this book! Every wardrobe needs a “WOW” piece; something with bold lines and sleek design features with just enough edge to set it apart from anything else in your closet. This stand out jacket is that piece. 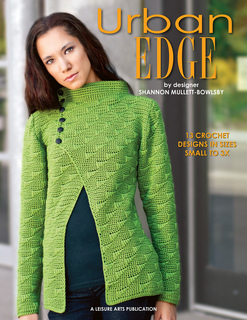 Featured on the cover of Urban Edge, this pattern includes the stitch chart for the geometric spike stitch as well as written instructions and schematics. The button band is added after the fact as is the roomy Mandarin style collar.